This paper describes a procedure that automatically generates parameters for the geometric modeling of kinematic chains. The convention of modeling used is the Denavit Hartenberg convention modified by Khalil Kleinfinger, noted DHKK. The procedure proposed here has two advantages. First the user does not need to calculate the geometric parameters by himself. He simply has to give the directions of the successive joint axes, and for each joint axis, a point that belongs to the axis. The second advantage deals with the use of model-generic matrices for the beginning and the end of the kinematic chains, and not only for the joint axes. This prevents the user from doing specific calculation to connect the joint matrices derived from the model with the initial and the final coordinate frames of the chain. Due to its unified formalism, the procedure allows to save time when the kinematics of the robot has to be changed. 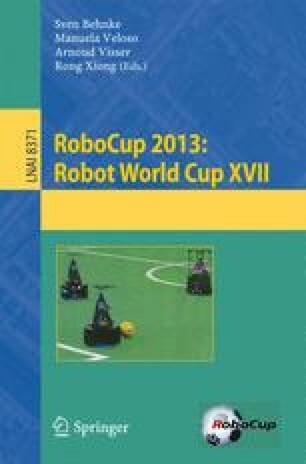 This paper includes the application of this procedure to the geometric modeling of legs and arms of two versions of the NAO humanoid robot, the one used in the RoboCup 3D Simulation League, and the other one used in the RoboCup Standard Platform League.